What is the secret to the continuing mystique of the original Chuck Taylor shoe? While other brands struggle to create the fanciest, most aerodynamic sneaker possible, one brand has been able to keep a “foothold” on the market without changing a stitch. Chuck Taylors, a.k.a Converse All-Stars, have been adorning the walls of sneaker stores for more than 20 years and are still selling strong. And as other shoe companies add more and more gadgets to their sneakers, the simple canvas chucks still have not taken the back burner. But the reason for the great and enduring popularity of Converse’s signature shoe remains a mystery. One theory is its cost. “The main reason I buy them is because they’re cheap, or at least they used to be,” said Jason Powers (freshman-physics). 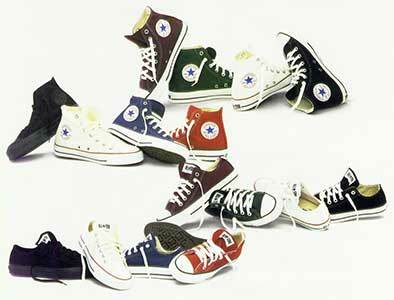 Doug Plocki (junior-administration of justice) said the only change Converse has made with chucks through the years is the price. “The people who come in to buy them are usually the ones who have a pair already on,” he said. And although the lightweight characteristic of chucks may have gotten the shoes their start on the feet of NBA players, they have been replaced on the court by flashier more technical shoes. The function of chucks now is primarily as a street shoe for walking, skating or “hacking” in. “They’re real comfortable and lightweight . . . not very clunky,” said Matt Albright (freshman-computer engineering). For some, wearing chucks is a way to get back to basics. Devoid of any padding or air cushions, they are made up of canvas sides and a slab of rubber for a sole. “I’ve been wearing chucks since I was in the first grade,” Albright said. Others jumped on the bandwagon slightly later, but many have been wearing the clown-like shoes for years, perhaps returning to them as a reminder of their childhood, Albright said. “One of my friends discovered them a while ago, and we all realized that chucks are a pretty cool, inexpensive shoe,” said Jason Powers (freshman-physics). It could be that people are simply attracted to their unique variety of colors, ranging from pink to plaid. Whatever it is, most people seem to agree that chucks make a statement. “It’s hard to figure out . . . I think they’re mainly popular because of their looks,” said Charlie Biddle, manager of The Shoe Fly, 214 E. College Ave. Biddle said he has seen the number of sneakers sold change each year, as they go in and out of fashion. “Every kind of shoe has a cycle, and now chucks are back in style,” Biddle said. But down the street at Wilson’s, the flow of sales seems to be more steady through the years, while the Nittany Mall store sells a lot less than the downtown store.